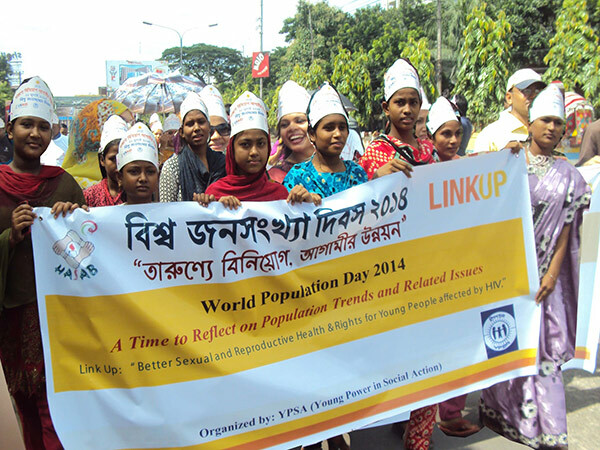 YPSA jointly with Department of Family Planning organized colorful rally and discussion meeting on 11 July to mark the World Population Day 2014 under the theme “Investing in young people”. Begum Sabiha Nahar, Member of Parliament inaugurated the program by hoisting balloons and festoon in front of Chiitagong Police Line, Damphara. The rally begins here and ends at GEC circle. People from all walks of life including government officials, students, teachers, NGO activists took part in the rally carrying banners and festoons. After the rally, a discussion meeting was held at the office of Department of Family Planning where Begum Sabiha Nahar, Member of Parliament was present as chief guest and Kazi Md, Shafiul Alam, Joint Secretary and Director of Family Planning Chittagong Division presided over the meeting. Dr. Alauddin Majumder, Director (Health) Deputy Director Family Planning, Chittagong Division Dr Sheikh Rukan Uddin were also present in the meeting. The speakers urged the NGOs to extend fruitful cooperation for implementing the government program aimed for population control.